Reflecting on dying is a work for few – it is frightening to know we have a limited time on Earth, and that we have absolutely no idea of how much time we have left. There are so many variables in the “death time” idea that our human mind can’t actually get to a reasonable guess number. The closest we can get is a biased and fearful intuition. As we usually measure ourselves in comparison to probability and statistics, let’s frivolously guess we will live the number of years equivalent to the result of the following equation: the sum of the dying ages of some people whose life conditions were similar to ours, divided by the number of those some people. Exactly how much time do you have? I have 48 years, or about 17,531 days. Seventeen thousand five hundred and thirty one days. That doesn’t seem a lot at all. Thinking about time as a limited resource may make us deal with it as we deal (or should deal) with money: consciously. Similar to analyzing if some object or service is worth x dollars, we should think if whatever we are spending our time on has value to us – if it is worth some of the limited and scarce time we have. Time and money have fundamental differences – you can’t store time, and you never know how much there is left. Not a reason to freak out, though – just acknowledge and live with the fact that you can’t have total control of your time as you can’t with your money. You will unavoidably end up spending some of it on unwanted events. As with money, you should definitely invest time – not on having more of itself , but on having a better life. What should humans invest time on? Please comment! Please remember that English is not my first language, so I apologize for any mistakes or weird word arrangements. Help me improve by sending an email to contacthoneytea at gmail dot com or commenting if you find anything wrong or bad-sounding! ← What is family for? For me, it depends on whether you truly believe in dualism (the higher and lower self) and how spiritual you are. It seems that believers in the “one life scenario” or to put it another way “a materialistic existence” are the ones who fear time the most. Universally speaking, if time is infinite and has no beginning nor end, then it is possible that “we” also have no true beginning nor end, and if you believe that our souls will return to the source (be it a cosmic consciousness or God), then physical death is just a transition period. its one energy, again. But the life we have as our current self, as our current consciousness, is limited, and ackowledging that might help making the best of it. Thanks so much for your interesting comment. 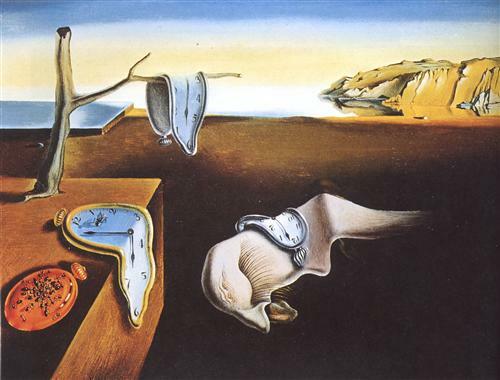 I love Dali’s work as well! I agree life isn’t made for us to suffer, but suffering is an unavoidable part of life. Resilience is key. Thanks a lot for commenting. The economy of time, don’t we all count seconds, minutes and years as if they were seeds to be stored and sown another day? We humans are delusional pattern makers, who make material what is immaterial. Linear time is an illusion. I am with Heidegger on that one. We are always constantly in the past and future with little regard to the present, which is all there really is. With Buddha on that one. I think we should spend time making the world–or our little corner of it–a better, kinder, happier place. That starts with ourselves, but spreads out to others. People should spend their time investing in projects and activities that produce outcomes THEY seek. It is my wish (not my judgement) that these projects and activities improve health, wellbeing and balance in an effort to benefit others as well as themselves.